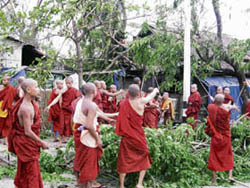 More than 10,000 persons have been killed in a tropical cyclone that struck Myanmar at the weekend, Foreign Minister Nyan Win told state television, adding that this nation would welcome international aid. At a late night meeting here today the Union Cabinet cleared the women’s reservation Bill that is aimed at providing 33 per cent quota for women in Parliament and state legislatures. The decision was taken at an emergency meeting of the Cabinet convened at the residence of the Prime Minister Manmohan Singh tonight. Seeking to put an end to the controversy over George W. Bush’s remarks on food habits of Indians, US Ambassador David Mulford dismissed suggestions that the US President had made any critical comments and said “hostile political commentary is not productive”. Do you agree that continuing female foeticide is a matter of national shame? A natural way to treat allergy, skin disorders, joint disorders and other chronic diseases permanently and without side effect. A hushed silence fell over the Manikarnika ghat shortly after six this evening when Pandit Puran Maharaj lit the funeral pyre of his father, tabla maestro Pandit Kishan Maharaj. After a dramatic start to the Lok Sabha today, Speaker Somnath Chatterjee withdrew the references he had made last Thursday to the parliament’s Privileges Committee against 32 unruly opposition MPs. The withdrawal came after leaders of the political parties in the Lok Sabha met the Speaker and assured him of cooperation in smooth functioning of the House. Special supplement to mark the 150th anniversary of India’s first War of Independence. Envoys of the Dalai Lama and Chinese officials agreed to further contact during a day of talks aimed at mending fences following a wave of unrest that pushed Tibet to centrestage ahead of the 2008 Olympics. Despite our earnest endeavour to keep The Tribune error-free, some mistakes do creep in at times. We are always eager to correct them. We request our readers to write or e-mail to us whenever they find any error. We will duly carry corrections and clarifications, wherever necessary, every Tuesday. Readers in such cases can write to Mr Amar Chandel, Deputy Editor, The Tribune, Chandigarh, with the words “Corrections” on the envelope. His e-mail ID is amarchandel@tribunemail.com. A revised pay package for the armed forces personnel, including enhanced military service pay for those below officer rank, would be finalised at a crucial meeting to be chaired by the Cabinet secretary K.M. Chandrashekar tomorrow. Over 12 students of Guru Arjun Dev Girls Senior Secondary School, Sarai Mohalla, were injured when the roof of Class XII collapsed on them this afternoon. A teacher, Seema Sharda, who was holding the class at the time of the incident, was also injured.